SUPER CHARGE YOUR WORKOUT BY GETTING ON A BOSU(R) Get on It! taps the power of the BOSU (R) to reshape your whole body while strengthening your core and stabilizing muscles. 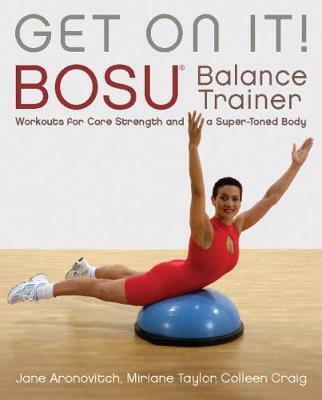 By showing how to adapt familiar exercises--such as lunges, crunches, leg lifts, push-ups and many more--to the BOSU(R), this book transforms simple moves into fun, challenging and highly effective exercises. Colleen Craig is a Stott Pilates trainer and a member of Playwrights Union of Canada. She received her B.A. (Creative Writing and English) from the University of British Columbia. Expanding on a decade of ballet training, she did her full Pilates Certification with Moira Stott (Stott International Training and Certification Centre, Toronto) and then began to adapt Pilates' work to the exercise ball. Miriane was one of the original teachers at the well known Stott Pilates Studios in Toronto. A former dancer and choreographer, Miriane now runs her own successful Pilates and training studio in Toronto and has been invited to teach and present both here and abroad. Jane Aronovitch is an exercise enthusiast and BOSU(R) connoisseur, as well as a writer who successfully creates all kinds of business, training, and technical materials. Jane is an expert at information design, having taught the principles of information design and writing for the web at the University of Toronto. She excels at presenting information in a simple and accessible way.